Thousands of Christian Orthodox pilgrims have crowded the Old City of Jerusalem for the Holy Fire ceremony. 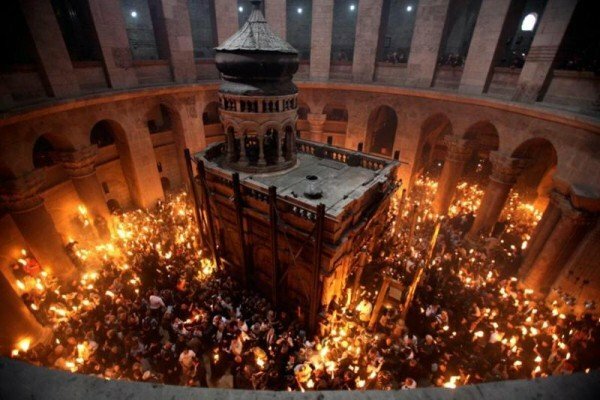 The Orthodox Easter Holy Fire is considered a miracle occurring every year on Holy Saturday, the day preceding Orthodox Easter Sunday. The crowding forced police to close the Christian Quarter and tempers flared as Christian pilgrims and local Christians could not get through to the Church of the Holy Sepulchre. The Church of the Holy Sepulchre is believed to be built on the site of Jesus’ crucifixion, burial and resurrection. Israeli police deployed hundreds of officers in to secure the old city as Christian worshipers from the Orthodox denominations eagerly anticipated the ceremony. Those who arrived early watched as the key-holder to the sacred site arrived to unlock the church doors. Due to the church being divided by different denominations, the keys are held by a Muslim man whose family has been considered neutral by all parties for several generations. Each year at 14:00 local time (12:00GMT), on the day before Orthodox Easter Sunday, the ceremony marks a miracle. After a procession around the church, all of the lights inside are extinguished before the entrance of the Greek Orthodox Patriarch who carries a handful of candles. When the Patriarch emerges, the candles are believed to be lit by a miraculous flame which is then used to light the candles of the congregation.